In our interconnected world, putting down your phone is becoming increasingly harder to do. 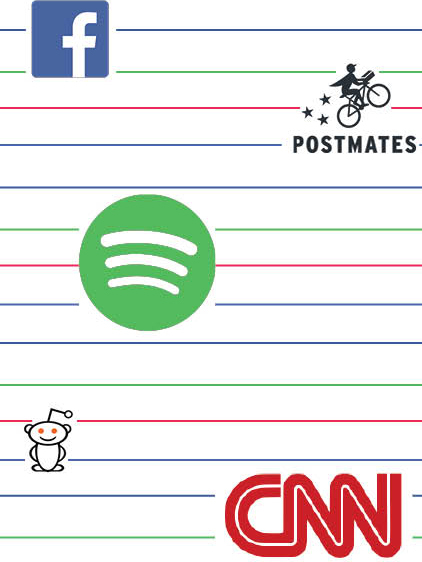 The Guardian investigated the most popular apps occupying UCSD students’ time and some new apps trying to break into the market. Patting your pockets, checking all of the compartments in your backpack, searching the desk around you, frantically, you look for your smartphone. When you don’t find it, say hello to nomophobia: the fear of losing or being without your phone. Coined by the UK Post Office in 2010, no-mobile-phone-phobia is a real source of anxiety that affects around 66 percent of adults, according to a UK YouGov survey. While it seems like the very definition of a first world problem, this anxiety is understandable considering that individual college students spend an average of 30 hours on their cellphones per week, according to a survey run by College Explorer, a marketing company targeting millennials. Considering this data, it isn’t surprising that college students are the early adopters of application and web services. As early adopters, students spread, publicize and incorporate apps into their lives before the rest of the population. This has been seen over and over again with sites such as Facebook, which has over 1.55 billion active users, or 21.7 percent of the world’s population. According to research by the Quello Center for Telecommunication Management and Law at Michigan State University, college students represent a critical part of smartphone adoption and smartphone app adoption. However, this proclivity, the choice that can make or break a hopeful young company, is strongly affected by peer usage and financial costs. In other words, we want something free that all our friends are also using. The UCSD Guardian set out to find out what apps are responsible for cell phones eating up over a day out of our week. When it comes to social media, 55.1 percent of those surveyed preferred Facebook to Instagram, Twitter or Snapchat. One third of those who answered noted that they preferred it because “everyone has it.” When it comes to ridesharing, Uber garnered 65 percent preference over Lyft and other services. The reasoning for preferences varied from dependability to the quality of user interface, but price played a large role and influenced 30 percent of those who responded. However, another 20 percent said they favored Uber because it was the first ridesharing service they tried. In light of these facts, up-and-coming apps and and online services need to get a lot of early adopters to ensure long-term success. Currently, three companies and their services are coming to UCSD to try to get Tritons as early adopters. Trebel, a music company that hopes to eclipse Spotify, is set to launch at UCSD in early Spring Quarter. The application allows you to download music onto your phone at no cost, other than to your attention to some ads. Trebel operates using a coin system where every play is a certain number of coins and you earn more coins by watching an advertisement while your songs are downloading. In addition, the app generates social activity by showing users what music is currently being downloaded or listened to on their campuses. Demonstrating the service to the UCSD Guardian, CEO Gary Mekikian emphasized that this application is completely different than Spotify, Pandora or other less legal music-streaming services. Trebel aims to use UCSD and other select universities as a trial run and then expand. Mekikian told the Guardian that they chose UCSD because of its unique student body. As early adopters, UCSD student have a singular opportunity to try to spread a new music streaming service, according to Mekikian. However, Spotify currently dominates the field for UCSD students with 53.9 percent preference. Of those who chose Spotify over SoundCloud, Pandora and other competitors, 65.2 percent cited its convenience as the deciding factor. Meanwhile, uCribs, a housing website that aims to serve the next round of house hunters as leases expire and more students leave the safety and expense of on-campus housing. The service connects students to landlords, or to possible subleases, while also calculating driving costs, assigning walkability scores and providing average rent data for the area. uCribs allows users to share listings with potential roommates as well as their family. Vice President Colin Kish told the Guardian that they chose to focus on students after their own challenges with housing and leasing. The uCribs team also relies on students’ habits with technology use to popularize their service. “The typical demographic of college students, the 18–24 age range, are usually tech savvy, making it a great fit for our service,” Kish said. “Our platform offers students the opportunity to utilize creative and purpose built features to solve the off-campus housing search puzzle that so many students go through each year. At the same time Pocket Points, an app that offers a variety of discounts to students for attending lecture, plans to expand to UCSD in the near future. Founded by former college students Mitch Gardner and Rob Richardson in the fall of 2014, the app works through a unique system that benefits both students and the businesses they patronize. To earn points, a student locks her phone through the app, ensuring that they are not using it during class. Using these points, students can get a variety of discounts for businesses. At the same time, Pocket Points works with local businesses to determine what type of discount works best for them . After a brief free trial period, businesses pay a small subscription fee to use the app, allowing the app to stay profitable. Since starting at CSU Chico in the fall of 2014, Pocket Points has grown to serve more than 100 university campuses nationwide. Beyond giving students a discount, Gardner sees Pocket Points as a possible cure for our generation’s nomophobia. Still, Gardner acknowledges that Pocket Points has its limits. While it can keep students off their cellphones, there is no guarantee that they will stay off their computers as well, which can be equally addicting. The variety of apps available to today’s college students certainly makes some aspects of life easier, but, as Gardner notes, cutting back on phone use in general can have a positive impact on people’s lives as well.